January 16, 2019 (Phoenixville, PA) – The Phoenixville Community Health Foundation’s Board of Directors announces President & CEO Louis J. Beccaria’s plan to retire in 2019 after 21 years of serving as chief executive. 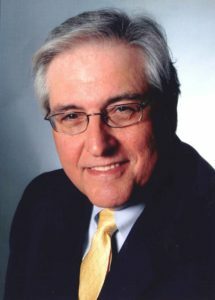 During his tenure as President & CEO, the Phoenixville Community Health Foundation has distributed over $37,300,000 in grants to nonprofit organizations to improve the health and wellness of residents of the Greater Phoenixville region, including 19 townships in the Commonwealth of Pennsylvania’s Chester and Montgomery Counties. Under Dr. Beccaria’s leadership, the Foundation also launched several programs and initiatives to improve health care access for uninsured residents, build the capacity of nonprofit organizations, and improve social determinants of health such as affordable housing and transportation that have a major impact on people’s health across the lifespan. 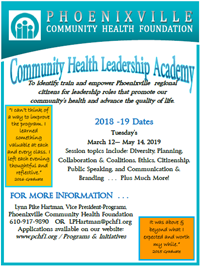 In addition, Dr. Beccaria was instrumental in conceiving and implementing a leadership program for local citizens (Community Health Leadership Academy) as well as the Executive Leadership Institute for current executive directors and aspiring executive directors in the greater Phoenixville region. “Through his extraordinary leadership, passion and understanding of philanthropy, Dr. Beccaria has changed the lives of so many people for the better and inspired others to do the same. The Foundation’s Board of Directors, staff and grantees are deeply grateful to him for his service to the community. “The Foundation will continue to build on his legacy of achievement while positioning ourselves to address the future health needs of our community,” said John Colarusso, Chairperson of the Phoenixville Community Health Foundation’s Board of Directors. acclimated to the Foundation’s business affairs and role in the community. Our goal is to have the transition completed by late fall of 2019,” said Secretary Evans. Before joining the Phoenixville Community Health Foundation as President & CEO in September 1998, Dr. Beccaria was President & CEO of the Stewart Huston Charitable Trust in Coatesville, PA. Previously, he has worked for the University of Delaware, the State of Delaware and Glenmede Trust Company, among other positions in community service. Dr. Beccaria earned an M.Ed. in Social Science, an M.A. in Urban Affairs and Public Policy, and a Ph.D. in Urban Affairs and Public Policy from the University of Delaware. Dr. Beccaria is also a graduate of LaSalle College High School and earned a B.A. in Social Science-Education from LaSalle College. “A person’s health is essential to their success in school, work and life. I am deeply honored to have worked with outstanding Board members who have embraced the concept of community health. Likewise, it’s been a blessing to have worked in partnership with so many exceptional people and organizations over the past two decades who have shared the belief that everyone in the Greater Phoenixville region should have the opportunity to be healthy and live well,” Dr. Beccaria said. “I look forward to sharing my enthusiasm for and knowledge of philanthropy in several other ways as an author and consultant following my retirement,” he added. The mission of the Phoenixville Community Health Foundation is to improve the health and quality of life for people in the Greater Phoenixville region by increasing access to quality healthcare services and promoting healthy communities through grant-making and collaboration with health, civic, business and community partners. « Grant Forum Info, Note Date Change!